Apple iPod Charger & more: MultiPot Personal Electric Multisocket Charging Hub & LED Lamp: recharge your iPod, cell phone, blackberry, etc., all in one place. Voted the "must-have product of the month" by Wallpaper magazine. Great gift idea! 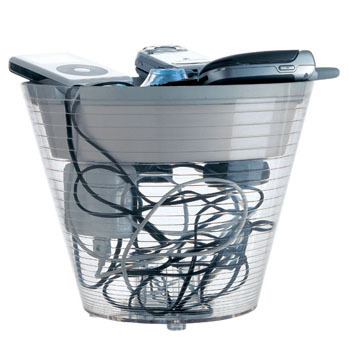 Recharge your iPod, cell phone, blackberry, etc., all in one convenient place. MultiPot belongs to a new generation of lighting objects. The hybrid, multifunctional lamp combines an LED ambient light with a multisocket, along with a space to tidy cables in the lamp`s vase. MultiPot provides new comfort levels, both in the home and at work by catering for both old and new requirements: or habit of emptying keys and other personal items, from pockets into containers, with new requirements to manage our increased use of rechargeable multimedia equipment, home computers and the transformation of televisions into home theatres With its familiar looks, lighting function and translucent finish, the MultiPot is a picture of elegant functionality. MultiPot also works as an ambient LED light source that can gently illuminate a darkened room or shed a glow at night on your recharging cell phone. The MultiPot casts light with a simple push of the button on the lid of the bucket.